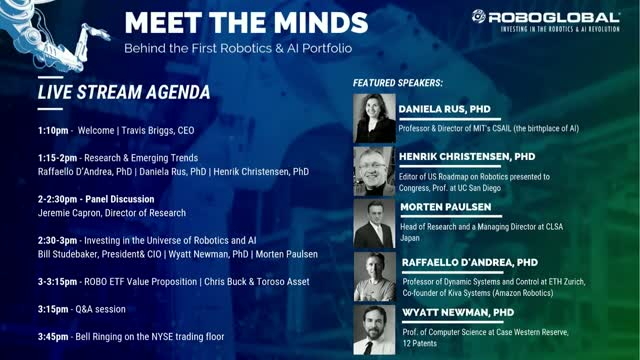 Join us for the live streaming of our exclusive event celebrating the 5 year anniversary of ROBO, the first index tracking the Robotics and AI revolution. The event is being held at the New York Stock Exchange on October 17th at 1pm. This is a rare opportunity to hear from world’s leading innovators in Robotics & Artificial Intelligence from MIT, ETH – Zurich, University of California and Case Western Reserve. Everywhere you look, robotics, automation, and AI (RAAI) is transforming how we live, work, and play. For investors, this multi-decade shift is driving unprecedented growth. We hope you can join us remotely to explore key trends and strategies for future-proofing your portfolios by investing in all that RAAI has to offer. Commentary from our executives on quarterly performance and market behavior in robotics. Henrik Christensen, Illah Nourbakhsh and Manish Kothari aren't just members of the ROBO Global Strategic Advisory Board, but also some of the top minds in the world of robotics and A.I. We're honored to have their insight and knowledge fueling the decisions behind the index and helping to keep ROBO state of the art in the realm of robotic developments.